The book explains Sadrā’s theory of the nature of afterlife. It presents Sadrā’s philosophical premises concerning the nature of human beings and their physical and psychological developments through which Sadrā shows how the afterlife is intimately connected to the nature of the human being and how it is a natural stage of the evolution of each individual in which a corporeal body has no role. Presenting Mullā Sadrā in a new light, the aim of this book is to investigate Sadrā’s metaphysical principles of the Return (al-ma‘ād) that have been either partially presented or misunderstood in most of the existing secondary literature. Focusing on Sadrā’s philosophical works, specifically the Asfār and his commentary on the Quran, this study demonstrates how Sadrā is a philosopher able to carry the premises of the previous philosophical theories to radically different conclusions. 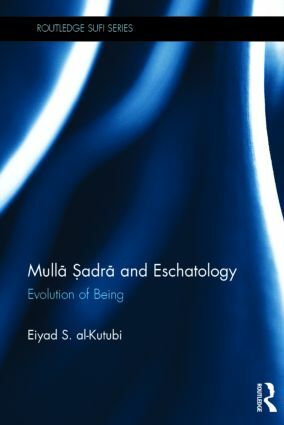 Mullā Sadrā and Eschatology demonstrates the manner in which Sadrā explains the Return as presented in the Quran and Hadith, but also shows how he presents the Return as a natural stage of the evolution of human beings in which a corporeal body has no role. Thus, Sadrā offers a plausible philosophical explanation to the problem of bodily resurrection that had occupied Muslim philosophers for centuries. Explaining Mullā Sadrā ‘s distinctive method of "doing" philosophy, this book will be of interest to students and scholars of Islamic Philosophy, Religion and Islamic Studies more broadly. Eiyad Salman al-Kutubi received his doctorate in Near Eastern Languages and Cultures from Indiana University.He is currently visiting assistant professor in Islamic Studies at the department of Religion/University of Illinois, Urban-Champaign and his research interests include Islamic philosophy and Quranic hermeneutics. The Routledge Sufi Series provides short introductions to a variety of facets of the subject, which are accessible both to the general reader and the student and scholar in the field. Each book will be either a synthesis of existing knowledge or a distinct contribution to, and extension of, knowledge of the particular topic. The two major underlying principles of the Series are sound scholarship and readability.